Personal individualized service is our promise to you! We visit with our customers to help them determine the best options for their project. We are able to customize gifts to make it special and one of a kind. Our turn around time is fast . . . usually 2 weeks, we do offer a rush option when time is an issue. We make every effort to complete your project by your deadline. Our customers are schools, teams, clubs, small businesses, parents, grand parents, and others who need customized products for events like weddings, reunions, Christmas, company promotions, etc. For your business it is all about communicating your message to a mass audience in a unique and interesting way. Anything that has a logo or slogan on it is considered to be a promotional item. Promotional products help to keep your business or organization in the public eye. You are able to connect with customers, prospective customers and employees in a creative and memorable way. For your school it is about community and team spirit. We can customize uniforms, t-shirts, sweats and other items for your sport, band, play, color guard or other school organizations. We have designs for all local schools. For your family it is about unity and memories. What better way to commemorate special occasions like family reunions, weddings, anniversaries, births, graduation, first communion or confirmations than a gift personalized with family photos and biographical information? Imagine your graduate's joy to receive a memory quilt commemorating the highlights of their life! Through the use of embroidery, screen printing, appliqué and dye sublimation printing we can transfer your message to just about anything. Shirts, jackets, hats, patches, mugs, mouse-pads, plaques, awards. . . the list is endless! Custom corporate apparel and promotional clothing is a great way to keep your business identity in the public eye. We can embroider directly on uniforms, jackets, hats and other pieces of work clothing, or create embroidered patches to sew on. From bank tellers to auto mechanics, custom uniforms and custom work clothes add a level of professionalism that helps your customers connect to your business. First impressions count, make sure your employees are stepping out with their best foot forward. 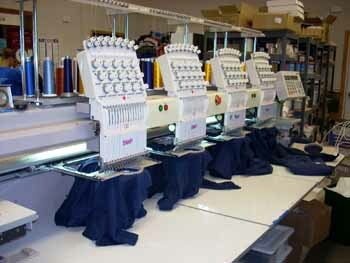 Call us at 320-275-2756 to have your name, title and/or logo embroidered on your work wear. There are times in our lives that we want to remember forever. Create custom gifts celebrating weddings, anniversaries, births, first communion, confirmation, graduations, a house warming or family reunions. No matter what the special occasion is you can make it more memorable by giving personalized mugs, hats, shirts, memory quilts, bags, coats . . . you name it. If you have a unique idea or item to place your message on, call us at 320-275-2756 and we will let you know if it can be done! "We've got the spirit, yes we do! We've got the spirit, how about you!?" Adding custom text and designs to your school logo is a great way to show your enthusiasm for sports teams, school plays, musicals, band, marching band, clubs and other school organizations and activities. We can appliqué school spirit shirts, sports jerseys, jackets and more using fabric, patches or tackle twill lettering. If you are a coach, teacher, chaperone for a school trip or parent we can help you create a design to apply to hats, shirts or sweat shirts to give away or use as fund raisers. Seniors, celebrate your last year in school with class t-shirts or hats. The possibilities for showing your school spirit are endless. Call us today at 320-275-2756 we can help you show your spirit! There are people and events in our lives that deserve some recognition. Creating a custom award or commemorative plaque is a great way to recognize a person for their accomplishments. Recognizing employees, customers, individuals or groups for important contributions is a great way to recognize accomplishments and motivate them to continue in their success! Call us at 320-275-2756 to order your custom plaques or awards!